Tracie Morris is a poet and vocalist who works in multiple media. She has performed extensively around the world. Her sound installations have been presented at numerous institutions such as the Drawing Center, Ronald Feldman Gallery, Thomas Hirschhorn’s Gramsci Monument presented by Dia Art Foundation, Jamaica Center for Arts and Learning, Dia: Chelsea, The Kitchen Performance Space, The Museum of Modern Art, The Silent Barn, and The Whitney Biennial. Morris is the recipient of awards, fellowships, and grants for poetry and performance, including New York Foundation for the Arts, Asian Cultural Council, Franklin Furnace, and Creative Capital fellowships as well as residencies at Millay, Yaddo, and MacDowell colonies. Morris’ work has been extensively anthologized and recorded. Her most recent poetry collection, handholding: 5 kinds, was published by Kore Press in 2016. She is co-editor of Best American Experimental Writing 2016 with Charles Bernstein, published by Wesleyan University Press. Morris holds an M.F.A. in poetry from Hunter College and a Ph.D. in Performance Studies from New York University and has studied American acting technique at Michael Howard Studios and classical British acting techniques at the Royal Academy of Dramatic Art in London. She is a former fellow of Creative Writing at the University of Pennsylvania. Morris has taught at many prestigious academies and is the founding Professor and Coordinator of Performance and Performance Studies at Pratt Institute, New York. 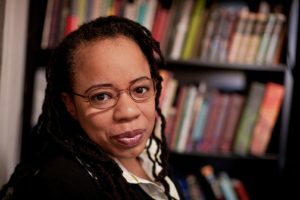 Tracie Morris will give a poetry reading on Oct. 26 at 6:30 p.m. in the Charlotte and Philip Hanes Art Gallery as part of the Dillon Johnston Writers Reading Series.